The discouraged borderline is mixed with the dependent or avoidant patterns. Such individuals pursue a strategy of submissive attachment to just one or two significant others. 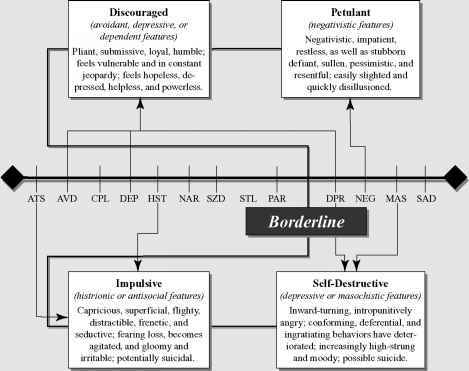 FIGURE 14.1 Variants of the Borderline Personality. 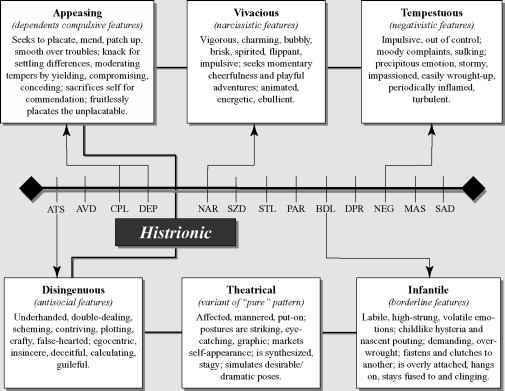 Prominent personality traits include not only avoidance of competition, loyalty, and humility but also masochistic subordination and a parasitic clinginess. By exclusively relying on a single someone, discouraged borderlines "put all their eggs in one basket." Always fearing that their lifeline is threatened, their world is chronically destabilized. Consequently, they are ever preoccupied with their lack of security, mainly their own helplessness, self-doubt, and lack of self-sufficiency. To reinforce their relationships, they cling tenaciously to whoever is available, merging their own identity into that of their partner. Given such profound needs, they are easily panicked by a sense of isolation or aloneness and easily feel depressed and powerless. Simple responsibilities seem monumental, everything is a burden, and life is empty and heavy. Should their sense of futility intensify, they may regress to a state of marked depression or infantile dependency, requiring others to tend to them as if they were infants. Other discouraged borderlines mix characteristics of the depressive personality. Such individuals have been taught to be conscientious and proper. They respect authority, tend to be grim and humorless, and expect rewards contingent on compliance and submission. Borderline characteristics begin to develop when the individual senses that this interpersonal pact has been violated too often—that others have selfishly failed to supply promised rewards of affection. Resentful and angry, they no longer believe that conformity will forestall desertion. 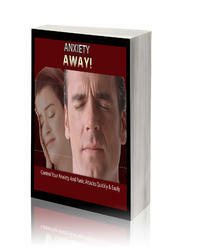 Instead, they feel coerced into submission and betrayed—emotions that periodically break through normal controls. Because anger is not only inconsistent with their self-image but also alienates or provokes those on whom they depend, intense negative feelings are experienced as dangerous. In response, they may swing to the opposite pole, becoming excessively preoccupied with self-reproach. Self-mutilation and suicidal attempts, symbolic acts of self-desertion, may be used to control their resentment or as punishment for anger.